I’ve never considered myself to be a very good "technical" beer judge. I can pick out flaws and what my taste buds “like” and “dislike”, but drilling the perception down into the building blocks of what makes a good beer versus a mediocre beer is a skill I have yet to refine. So when it comes time for me to critically evaluate a beer, I’m often inclined to use a “crowd-sourcing” approach and feed it to a lot of other beer aficionados.. This was never more true when it came time to evaluate my Dark Side of Denmark rye beer that was brewed for our Recipe Formulation Project (RFP). While my beer was originally brewed back in February, it was not until almost two months later that I finally got the beer into a keg and ready for serving. Luckily, that was right around the time that Tom came up to Rhode Island for a visit, so I was not going to miss out on the opportunity. Only the base beer was available at this time, so the initial tasting was limited just limited to that. The RFP beer presented with a great ruby brown appearance with a spicy, malty nose to it. The flavor, however, was not enjoyable. While the beer starts off with a fresh pumpernickel sweetness to it, the favor drops off in the mid-palate leaving the beer somewhat lackluster or empty. As the beer finishes out, a spicy finish arised from the rye malt that lasts into the aftertaste which I found unpleasant. The pro's of the bee good appearance and initial flavor. The con's: weak in the middle and the residual spiciness at the end. Flash forward another two months after the beer has been sitting cold in the keg with time to mature (i.e. I had forgotten about the beer and only recently realized that I need do the dosing). With some luck, a club meeting for my local homebrewing club (RIFT) was almost upon me and it would be another opportunity to collect some valuable feedback from several other experienced palates. 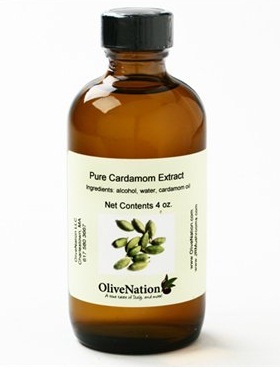 For this tasting, I was finally able to get a cardamom extract (purchased from here) on hand. I prepared three beers to evaluate: the base beer, a medium dosed beer (6 drops in 12 oz), and a heavy dosed beer (12 drops in 12 oz). All the bottles were capped, kept cold, and toted off with me to the club meeting. The base beer had improved considerably since the initial tasting with Tom. The residual spicy flavor that had turned me off had mellowed out considerably. Additionally, while the mid-palate flavor was still a little lacking, because the flavors had time to meld together, it was less noticeable as when the beer was still “green”. The cardamom flavoring was very enlightening. The savory flavor of the cardamom meshed well with the beers flavors without clashing. It was the intensity of the dosing that got the most comments - the extract was certainly potent, which was apparent once the medium-dosed (i.e. 6 drops) beer was opened. While not overbearing, I was asked if I could edge the cardamom flavor back a bit in the medium-dosed beer. The balance was in need of some tweaking. The heavy dosed beer (i.e. 12 drops) was just that – heavy with cardamom. The strength of the extract made the beer more like a cardamom drink flavored with beer as opposed to the other way around. A few tasters enjoyed this (and later admitted that they were big fans of cardamom), but it was in the wrong direction of what a spiced beer should be in my opinion (i.e. a solid beer with a hint or tease of the spice). The experiment was a great learning experience. At the end of the tasting flight, I tallied up the suggestions on how I might be able to modify the recipe to improve beer. Below are a few bullet points with the most relevant / useful suggestions that I may consider using when I plan the rebrew. The base beer needed a bit more maltiness to hold up to the cardamom flavoring as well as to support the mid-palate. Tone down the rye flavor a bit in the base beer so it is not so strong. I’ll plan on rebrewing this beer sometime in the future and report back on whether the changes improved or detracted from the beer concept. Otherwise, I hope the readers find this project to be interesting and potentially educational. “"I drink when I have occasion, and sometimes when I have no occasion"